TravStar1 Point Of Sale SystemRegister Manual Fleet MenuHow Do I Print Comchecks? How Do I Print Comchecks? Touch the "Express Check" button. 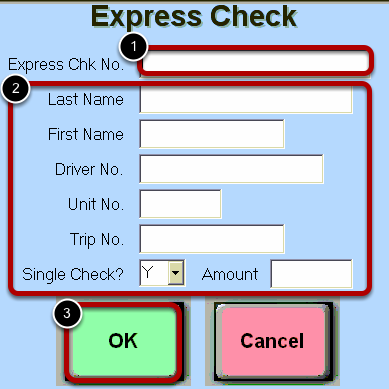 (1) Type the drivers express code. (2) Type all additional driver's information using the keyboard. (3) Touch the "OK" button. The transaction information will now be sent to the credit processor. If the transaction is approved, a check should print on your Comdata check printer. 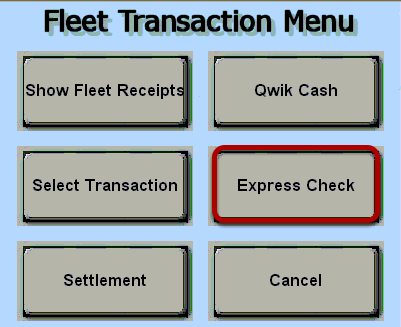 Next: How Do I Settle EFS Transactions?